EXYZT is a collective of architects, builders, cooks, gardeners, photographers and more who develop situations, actions and installations in the city. EXYZT’s MetaVilla, curated by Patrick Bouchain, took the architecture world by storm as the most popular and talked-about Pavilion at the Venice Biennale of Architecture 2006. 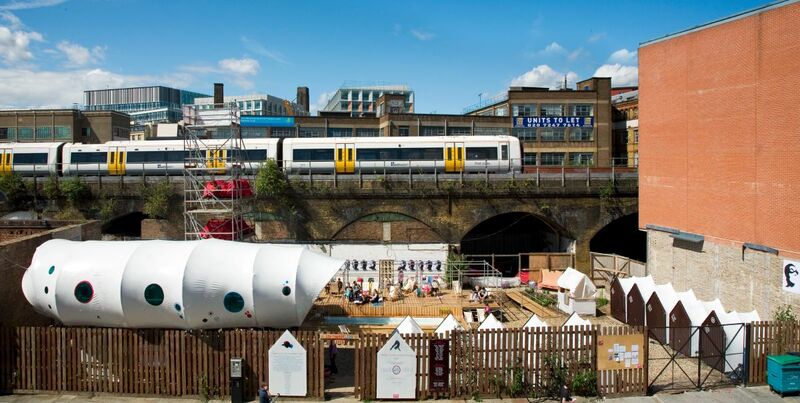 London projects include the Dalston Barn and Eastern Curve Garden with muf and J&L Gibbons (winner of Hackney Design Awards 2010); Dalston Mill; and Southwark Lido. The city we love is that in which anything is possible, where there is still space for spontaneous social, cultural and economic games. A city that resembles those who create and inhabit it. We defend the idea of architecture not as a simple act of design and build, but as a tool that needs to be combined with other skills and practices to create new forms and strategies of building and living in the city. Sara Muzio is a film-maker, writer, and curator of urban interventions, with a particular focus on the metabolism of cities. Using a range of creative tools, she specialises in bringing an imaginative and critical approach to nurturing communities and conversations through culture. The Southwark Lido was created by EXYZT and Sara Muzio. Lake Estates, a real estate development and investment company, is a family owned and run business which has been operating for thirty years. As an independent developer located in Southwark, Lake Estates has been a pioneering supporter of the interim use of sites awaiting development, which bring neglected spaces into use. Lake Estates and Solidspace acted as promoters and patrons for EXYZT’s Southwark Lido in 2008; Wayward Plants’ Urban Orchard and Urban Physic Garden in 2010-1; and David Kohn Architects / The Architecture Foundation’s Skyroom project on the rooftop of Magdalen House. In developing The reUNION, Lake Estates, Solidspace, EXYZT and Sara Muzio will be working closely to see how this playful temporary project can influence permanent development on the site.